To avoid what amounts to a modern day version of the Trojan Horse, Denver Public Library has banned one of its most avid borrowers due to his continued introduction of vermin into the book collection. The borrower in question, Roger Goffeney, is actually uninterested in reading the books he takes out. Rather he reviews the books, comparing them to online versions scanned into the Project Gutenberg database of archived materials. Unfortunately, this review process takes place in Goffeney 's home, an apartment in downtown Denver owned by the Catholic Archdiocese. 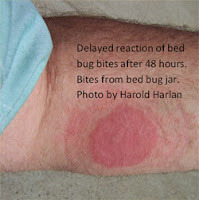 This apartment is infested with bedbugs, and therein the rub, or rather the itch. 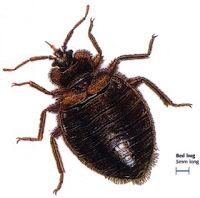 On three separate occasions, the main branch of the Denver library has been quarantined and fumigated due to Goffeney's returning of books with a little something extra inside: namely bedbugs, their larval offspring, and their feces. Thirty-one books have been destroyed in efforts to contain the infestation, according to Susan Greene of The Denver Post. Many of the books Mr. Goffeney has contaminated are rare volumes of classic literature obtained via interlibrary loan. This fact led Denver Public Library's Manager of Security and Safety, Tom Scott, to point out: "It's everybody's collections and everybody's homes at risk." Library officials have asked the erstwhile preservationist to bag any books he returns, and to refrain from returning them in the drop slot that empties directly into the building. He has refused to cooperate. The library responded by canceling Goffeney's borrowing privileges, and banning him from the premises. "At this point, it's an intentional act," says Tom Scott. Costs for fumigating the main branch have reached $6,000. This does not include the replacement cost of the books that have been damaged or destroyed. Goffeney recently visited the offices of The Denver Post in order to protest his "unfair" treatment by the library. He's irate that the system has banned and fined him, and that he will be charged with criminal trespass should he try to access the facility. He fails to see the irony in the fact that the very books he hoped to preserve wound up being destroyed due to the blight. "Huh . . .," he says. "I guess I've never thought of it like that." An article not best read just before retiring for the night.